The family gathered this weekend to celebrate dad’s 78th birthday. Three generations of family gathered in honor of our patriarch. 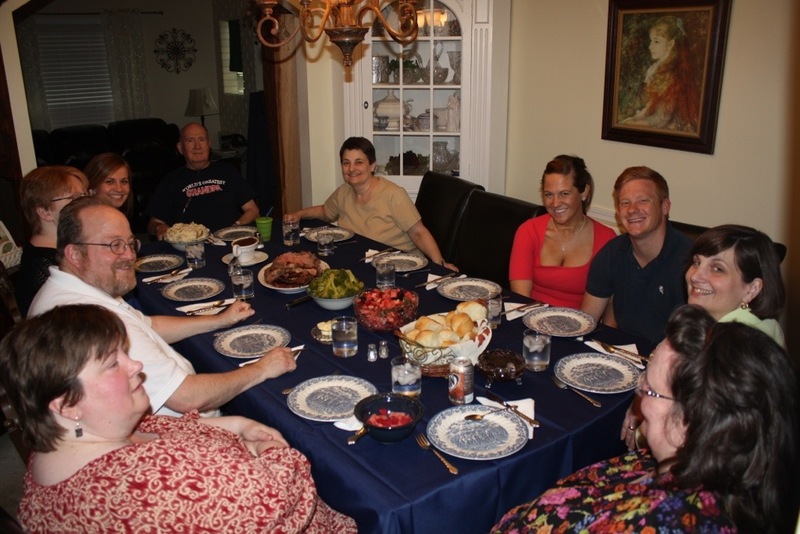 The dinner table became a place of entertainment, laughter, memory sharing, and love. I wanted to share my thoughts about the evening and some life lessons revealed about love. The significance of the event was not just a 78th birthday celebration, but a celebration of a life lived with love. Dad’s birthday will be the last he shares with us here on earth as he is finishing up a battle with lung cancer. With that as the backdrop one might expect a somber, or sad affair … Let me tell you, it was not! We laughed, at times so hard tears filled our eyes. We shared great memories, and were regaled by the youngsters with story after funny story. Sitting back and watching I was struck by the connection we all have. It is a deep and abiding connection forged in the love of Christ and demonstrated by mom and dad, down through children and grand children. We came to a time of gift giving, and dad had a special gift to give to each of his girls. He gave each one a beautiful necklace with a birthstone representing mom, dad, and each girls particular stone. A gift of love, and a legacy to be reminded of. Next came gifts for dad. It was during this time that tears were shed as practical, as well as personal gifts were given that spoke of the integrity, honor, Christ centered living, and demonstrated impact dad has had on all of us. The best word to describe the gifts would be love. That love is important because it defines who dad is. He is first and foremost in love with Christ. It is evident as he closes his eyes to pray, and it is evident in quiet conversations about heaven that he has. It also defines who he is in relationship with his children, and grandchildren. The words shared in a card, a note, or in a frame all coalesced around a common idea of how he demonstrated his love for each one of us. In so many practical and thoughtful ways each of us knows that he loves us, beyond a shadow of a doubt. His love is not confined to just Jesus and his family, but it also extends out to those in community around him. Several gifts focused on contributions made to help free girls trapped in slavery, wells to provide water to villages without hope, and children sponsored in order to provide hope, healing, and most of all love. As I sit hear trying to imagine a world without dad, I am reminded of the love lessons he has taught us through the years, and the love lessons he is still teaching us today. I want to live as he has lived, a man in love with Jesus, in love with his family, and loving the greater community. I want to demonstrate that love with the words I say, the relationships I build, and a willingness to share blessings with others. Dad … thank you for the love lessons. This entry was posted in Uncategorized and tagged agape love, blessings, Christ, dad, Grace, Helping Others, Jesus, memories. Bookmark the permalink. Very nice Tim. And the greatest of these is Love! A gift that will never die. Blessings to all of your family.